Carrier Introduces Innovative EcoBlue™ Technology. Featuring Industry-First Beltless Indoor Fan System in RTUs. 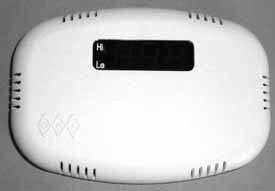 More>> New LUX PS2100 WiFi Thermostat. Grundfos Introduces TPE3 In-Line Pump. Designed to significantly advance pumping systems for commercial buildings, Grundfos has introduced a state-of-the-art TPE3 in-line pump that features best-in-class technologies. More>> Armstrong's New Active Performance ManagementTM Solution. Active Performance Management is patented onboard software that learns predicts, adjusts automatically and makes optimization recommendations in real-time. More>> Bacharach PCA® 400. The NEW The NEW EvenAir® Whole House Comfort Control System modulates air delivery to balance temperatures. Key Benefits: Meets Title 24, reduces HERS testing, material saving from 47 to 57 percent over traditional zoning, reduces wiring by 50 percent. More>> The new Wi-Fi Smart Control by QuietCool. With the QuietCool Wi-Fi Smart Control, simply open the QuietCool app on your phone or tablet, open up a window, and turn on your QuietCool fan! You can control the speeds of your fan as well as the countdown timer, from 30 minutes to 8 hours! . More>> Digital Customer Notification. in just seconds without splits, blemishes and burrs that cause leaks associated with slow traditional flaring tools/blocks. More>> Nortek Global HVAC Launches New 16 SEER Packaged Heat Pump. Model Q7RF boosts efficiency in a packaged product. More>> Spirax Sarco introduces Steam Jet Thermocompressors. Tankless WiFi Adapter from Noritz Offers Flexible Installation, Simple Usage. Installable both indoors and outdoors, the new Noritz Connect WiFi Adapter and app provide only the relevant data that homeowners need.More>> Superior Technology & Supplies Corp.
1P100-ST The first Single Phase, 208/240 VAC Soft Start for 3,4 & 5 Ton Residential & Commercial Air Conditioners. More>> New Armstrong COMPASS R Represents the Next Technology Evolution for Circulators. Nortek Global HVAC Launches New Reznor Light Commercial Rooftop Units. New rooftop units appeal to new construction. Nortek Global HVAC introduces a new line of highly configurable Reznor® light commercial packaged rooftops. They are available in 6, 7.5 and 10 tons. More>> RLM Small Systems Ultraviolet Lamp Kit from UV Resources Improves Air Quality and Overall HVAC System Efficiency. Designed for smaller, hard-to-service HVAC components, the S/S Kit inactivates efficiency-compromising microbes that accumulate in the system. More>> New – Fluke 787B ProcessMeter™. Easy-To-Install and Affordable Grundfos SCALA2 Domestic Booster Pump Offers Constant Water Pressure Regardless of Tap Quantity Or Time Of Day. The intelligent and low-noise Grundfos SCALA2 domestic booster pump offers homeowners the holy grail of constant water pressure. More>> Belimo Now Offers HVAC Zone Solutions for Residential Applications. Fluke 902 FC True-rms HVAC Clamp Meter improves productivity in the field. New wireless Fluke Connect meter enables HVAC technicians to create reports and collaborate with peers from the work site. More>> Superior Technology & Supplies Corp.
1P100-ST The first Single Phase, 208/240 VAC Soft Start for 3,4 & 5 Ton Residential & Commercial Air Conditioners. More>> Cloud-Based Diagnostic and Analytics Platform for HVAC Service Providers. SEMCO Introduces Aluminum Desiccant Wheel Drop-In Cassette for ERV Retrofits. Unitary Wheel Cassette is designed as the HVAC industry's first drop-in replacement for polymer desiccant wheels in most ERV brands. More>> Johnson Controls introduces Quantech Air-Cooled Chillers. Quantech chillers ship virtually immediately from inventory, making replacement available in as little as two days to minimize downtime and restore comfort quickly. More>> Introducing the WFDN Series Waterflow Detector from System Sensor. Copper Cop Air Conditioning Protection System. Copper Cop™ is an efficient, dependable and reliable security protection solution designed to combat theft of commercial air conditioning (HVAC) units. More>> New Belimo ZONETIGHT™ Zone Valve - Efficient in Every Way. Nashua 555 FlexFix UL-Listed Film Tape. Provides an economical solution for sealing connections and joints in flexible duct work, sealing dryer vent connections, or sealing bubble wrap and reflective insulation materials. More>> Noritz Unveils Breakthrough Replacement Technology with the EZTR40 Residential Water Heater, a 40-Gal. Replacement. 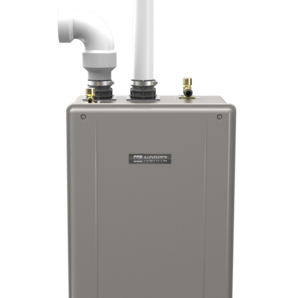 Noritz is the first tankless manufacturer to offer a condensing residential unit with top-mounted connections and flexible venting through existing B-Vent. More>> NetworkThermostat CloudConnect™ for Net/X™ Wi-Fi and Ethernet Smart Thermostats. This innovative system is ideal for PEX, copper and CPCV tubing, installs in minutes, and it is available through your local plumbing distributor. More>> Dynamic Air Diffuser - A Winning Combination... Diffuser & Ceiling Fan in-one. Acting as both a diffuser and a ceiling fan, the Dynamic Air Diffuser REQUIRES NO POWER by utilizing the forced air from the operating HVAC units in the building. More>> Introducing OvalSox - Oval HVAC Ductwork now available! Introducing the new touchscreen Observer™ communicating wall control. More than a thermostat, the Tempstar® Observer™ Communicating Wall Control offers the sleek look and touchscreen convenience of popular smartphones. More>> hilmor HVAC/R tools. Get in. Get out. Get on to the next job. EASY, FAST, EFFICIENT JOIST SPACE HEATING. Designed specifically to install in the joist space, there is no need to change or add height to the existing floor above. More>> Grundfos Expands Intelligent, Integrated Variable Speed Motor Control for HVAC/R Pumping Systems Up to 30 HP. WiFi FILTERSCAN® Air Filter Monitor from CleanAlert Takes the Guesswork out of HVAC System Filter Maintenance. HVAC contractors instantly know which customers require service via local, text and e-mail alerts. More>> Save time and money with new Coleman® exact-fit replacement rooftop units. Units simplify installation by eliminating the need for curb adaptors. More>> VRV meets VAV with the New DZK (Daikin Zoning Kit). The ComforTune System gives you an “better” option to offer homeowners looking to replace a failed PSC motor or those looking to upgrade their system on a budget. More>> AmiraLin LLC Magnetic HVAC Strap™. Oven Industries features a Temperature Controller with easy-to-use software. more info Rosenberg UNOBOX Fans. Download Your Free Carrier® Rooftop App Today. Get direct replacement equivalents and where-to-get-it information covering most major rooftop brands. More>> REHAU Smart Controls. REHAU Smart Controls brings harmony to energy performers with an easy-to-use, PC-based controls solution that you configure to meet the needs of each customer. More>> Turbonics TOESTER 4/5 &6/8 WALL MOUNTS. Mechanical & HVAC Contractor Software. Integrated software solution that’s been delivering out -standing performance to HVAC contractors for more than 25 years. More>> Bosch Geothermal Heat Pumps. The most energy and cost efficient systems on the market and therefore the greenest technology for heating and cooling. More>> PEX tubing – Offering Countless Benefits over Copper Piping. Turbonics Hydronic Fan Coil With Built-In Circulator. Thermostat System. Access your thermostat wirelessly from anywhere in the world via the Internet. More>> Honeywell Circulator Pumps for Hydronic Systems. MO.S.T. – Contractor. Service management software designed to streamline business operations between the field & office. Developed by an HVAC Contractor for the HVAC Industry. More>> Enviro Air Products, Inc. Air Distribution Products. Representing major manufacturers. Most products we Distribute are stock Items and can ship in a matter of 2 to 3 Days. More>> Turbonics Macro-Zonal™ Hydronic Mid-Velocity™ Blowers Hydronic/HVAC Industries latest innovation! Viconics VC3000 Series Line-Voltage Switching Relay Pack Controllers. A new cost effective solution is available for upgrading line- voltage fan coil unit thermostats! More>> Jackson Systems WCZ-600 Wireless Comfort™ Zone Panel. Fulton’s Pulse combustion condensing hydronic boilers. Pulse boilers require electricity only for purge cycles, powering fuel valves, controls and other safety features. More>> Cliplight Flash(TM) Leak Detection Kits. One-person operated with video inspection. Dispatch Software for HVAC Service Contractors. Stop Air Leaks. Maximize HVAC Efficiency. Stop theft of air conditioning coils on homes and commercial buildings. The new Field Oil Vent Damper™ reduces heat loss, improves efficiency and comfort. More>> Superior Technology & Supplies Corp. Install stainless, track bottom sink completely from the top with a snug, secure fit in a fraction of the time of traditional sink installation. More>> Lennox 48K98 BCC circuit board. PEX-a Tubing with an Oxygen Barrier for Radiant Heat. For T-bar or lay-in ceiling applications. GRI Temperature, Humidity & Water Sensors. Honeywell S8610U3009 One or Two Rod Intermittent Pilot Control. Dwyer Instruments NEW Series ZV1 and 3ZV1 Zone Valves. 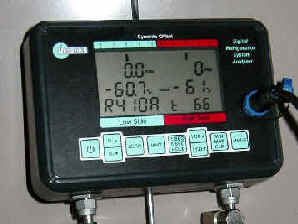 DIGI-COOL DRSA Digital Refrigeration System Analyzer. XtremeFLEX® HSTAT Silicone Rubber Heating Tapes with Adjustable Thermostat Control. Continental Industries, Inc. Round and Square Ceiling Diffusers. Honeywell AQ475A Aquatrol Outdoor Temperature Compensator for Boilers. LuxPro PSP300 Programmable Outlet Thermostat. AERCO - Benchmark 3.0 Low NOx Condensing Full Modulation Boiler. TAC MNB-300 MicroNet BACnet Unitary Controller. Honeywell Non-Spring Return Low-Torque Direct Coupled Actuators. Advanced Distributor Products High-Efficiency R Series Air Handlers. Generate better leads Book more new appointments Pursue every opportunity with Service Hook. The quickest, easiest way to increase your bottom line is to get better on the phone. Service Hook will provide your business with the insight, and the tools, to OWN the phone. More>> Savoy Engineering Group - Load Calculations. Become a Dr. Energy Saver Dealer! Dr. Energy Saver is building the nation's largest network of home energy efficiency contractors. Now is the best time to join! More>> Applied Research Laboratories (ARL) HVAC Product Certificatio n & Safety Testing Services. Total Immersion Service Contractors Sales Summit. We have helped many climb the mountain to reach the 20% net profit range. We have seen success and the lack of it so many times that we can smell it a mile away. Check out our fall schedule. Build everything you need to market your HVAC business quickly and affordably. View a day in the life of an HVAC worker.